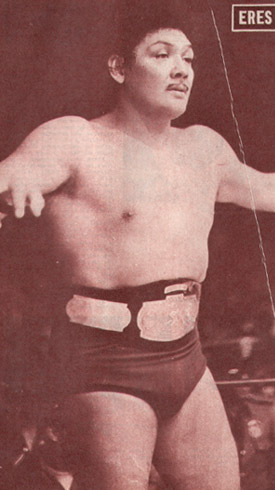 Ciclón Veloz Jr., second generation wrestler whose father was one of the initial stars of lucha libre in Mexico, made his pro wrestling debut in 1959. He wasn't a major national figure (unlike his father who was an opponent of Santo, Demon, etc. during the 50s, in fact he's probably known by fans nowadays as the guy that Santo wrestled against in his debut with that name), but he was a star in Monterrey where he won the mask of Li Chan (Cesar Silve, at Arena Coliseo), and won Carnicero Aguilar's hair twice (once at Arena Coliseo, once at Plaza de Toros Monumental de Monterrey). He also won La Momia del Faraón's mask at the Gimnasio Josué Neri Santos of Cd. Juarez, Chihuahua on November 30, 1975. After retirement in the early 60s, his father took over a job as a promoter and road manager for the Northern Mexico area, working for La Empresa and having Monterrey's Arena Coliseo as his home base. Ciclon Jr. was one of the first Mexicans to use the "Jr." in the name, perhaps even the first one. He was a very popular star in Nuevo León state and even had a nice reign as National Middleweight champion after defeating local icon Humberto Garza on April 6, 1971 at Arena Coliseo in Monterrey. He defended the title several times in Mexico City as well, and he ended up losing it to Adorable Rubí, an "exotico", on December 14, 1973 in Mexico City. Veloz died on August 30, 2001 at 00:35 after suffering esophagus cancer. It was a very hard strike to the family, he was Kung Fu's cousin, making it two losses in a single year. He was given respects at the Capillas Raymundo Sánchez, and he was buried at the Panteón del Roble. May he rest in peace. ??/??/?? hair Ciclón Veloz Jr. Carnicero Aguilar Plaza de Toros Monumental - Monterrey, N.L.